In November, we came home clutching two very young oak trees from our day at Dijous Bo (which means ‘good Thursday’ in mallorquín). A stall at the annual fair – Mallorca’s largest traditional event of its kind – was handing out small tree plants to anyone who wanted them. 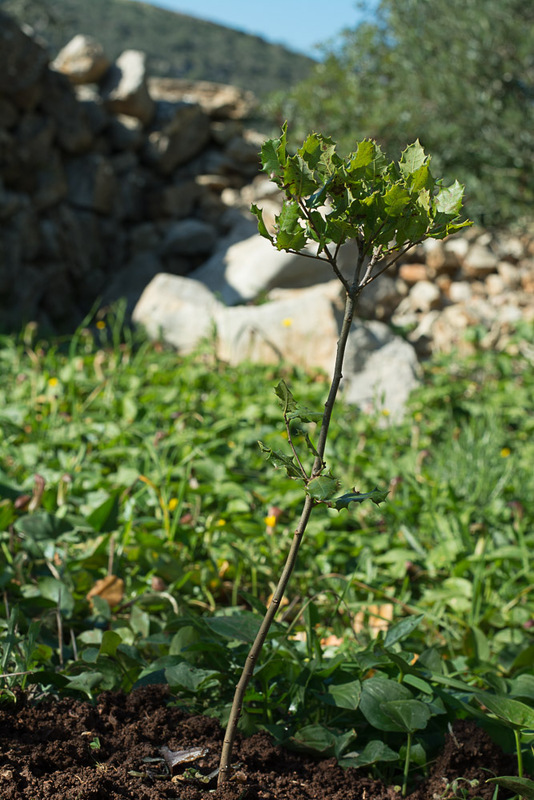 Although our rural Mallorcan finca has plenty of land, it doesn’t have a lot of soil, but we figured it had to be worth at least giving these young trees a shot at growing into something for future generations to enjoy. Because I had a large amount of writing work to do, we stuck the well-rooted plants into a bucket of water and put them aside. Planting things here is a bit of a logistical operation that we didn’t have time or the energy for then. The New Year on Mallorca started with glorious sunshine and blue skies. We’re in a period known as ‘la calma’, when we enjoy clear skies and warm sunshine, and usually kid ourselves that winter is going to be mild this time. Reality is sure to hit soon, but the conditions were perfect for a spot of gardening. And what could be better than planting two young trees on the first day of a new year? A pickaxe (an essential piece of kit for planting anything on our land), shovel, gardening fork, and watering can were deployed and we now have two baby oak trees at the end of our field. We’re never likely to be able to shelter from the sun beneath them but, one day in the distant future, somebody will be able to enjoy these trees. And that’s a good feeling at the start of a New Year. Hi Jan and Happy New Year! Love the thought of planting trees! Are these Holly Oaks as the leaves look Holly-ish? And how does a Spanish Xmas differ from a UK one, do you know how the locals celebrate? Have you made many Spanish friends? Hi Denise! I chuckled at the Holly Oaks mention! They do look like holly, but they are actually holm oaks, which do have a holly-ish look about them when they’re young. We’ve never seen any proper holly on Mallorca, as we note every Christmas. The only holly we have seen is a type of sea holly, which grows in dunes. No pretty red berries spotted though! When we first moved here a decade ago, Christmas itself was very low key, as the present-giving here has traditionally been from the Three Kings, on the evening of January 5th. Today in Spain is a public holiday, and children will have been opening their presents this morning (or, if they’ve been naughty, just got a few lumps of coal!). Over the years, Christmas has become more important (but nowhere near as commercialized as in the UK). Now the lucky little ones get presents from Papa Noel and The Three Kings! Locals tend to have a big meal of seafood on the night of Christmas Eve and on Christmas Day they often have roast suckling pig. Christmas is a real family occasion here, and the locals think we’re a bit weird because we celebrate Christmas Day on our own! We do have Mallorcan friends and acquaintances; we wanted to live in an area where there weren’t too many Brits so that we made an effort to get to know the locals. Hi Janice, I was just looking at your blog to see how you are doing and I had to comment. I am sure your oak tree is a holly! It will still look lovely and won’t take so long to grow. Hi Denise! Yes, family is very important here and I like that. It helps that the island is small, so it’s not far to travel for locals to visit family. Older folk here seem to be revered rather than forgotten, on the whole. I so wish it was like that here, that we looked after our elderly together. The downside of that kind of culture temds to be that all generatiions live together, as in Indian culture where you are likely to marry and move in with your husbands family. Would definitely NOT like that!